Devastation in Haiti! Please Help! Much of Port-au-Prince has been destroyed, including even the Presidential Palace (above) and the United Nations mission. Thousands of people, possibly 100,000, have been killed by the earthquake that hit Haiti at 5pm Tuesday evening. Outreach International has been working in Haiti since the 1980s and currently supports a network of 90 schools serving over 9,000 children. Some of these schools have been severely damaged or destroyed. 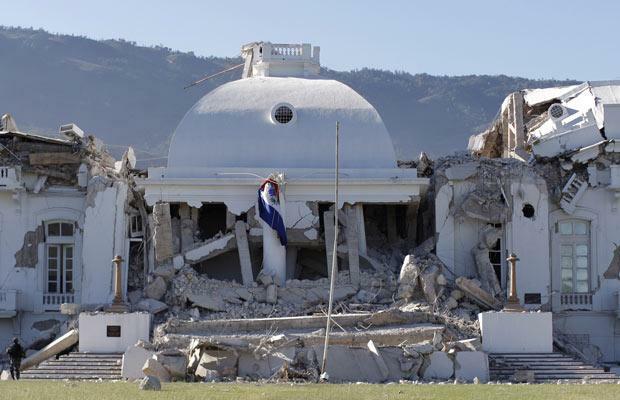 Worse yet, schools were in session at the time of the quake. Students and faculty undoubtedly suffered serious injury or death. Let’s work together to help Haitians in their time of tremendous suffering! Please do what you can to help! Donate HERE at the Outreach International website. Outreach International helps people overcome the effects of poverty and develop the capacity to create a new future for themselves and their community. We do not believe in short-term fixes, but in long-term solutions. We call this Sustainable Good. This entry was posted in Outreach International and tagged Haiti. The church has also posted on the chatroom and sent to leaders the announcement that $25K will be given immediately from the oblation fund to the Red Cross and that oblation funds collected through Feb 7 will also go there. As Beware the Chicken already noted there, you can give to the Red Cross directly by going to its web site. The process there takes less than 2 minutes.